First in the RG Bud Phelps Life Series books, Gibbon’s Secrets is a historical fictional tale about a boy growing up in a small town during and after World War II. Through the fun of a fictional setting, Bud shares real memories of the home front. 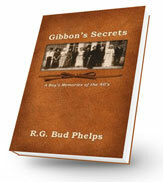 To purchase Gibbon’s Secrets or other titles by RG Bud Phelps visit our online store. Second in the RG Bud Phelps historical fiction ‘life Series’. This book covers the years from 1945 to 1955. The historical fiction account is based on his personal memories of growing up in the Middle-American town of Curtis, Nebraska. The story, which parallels Bud’s memories from high school through his service in the U.S. Navy, represents the memories and experiences of thousands of Americans who grew up in the same era. 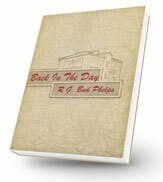 To purchase Back in the Day or other titles by RG Bud Phelps visit our online store. 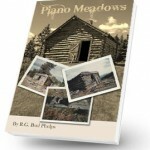 In real life, Bud Phelps visited the places mentioned in this historical fiction book and he incorporated many of his memories into the details of the engaging mystery story. The tale begins with a murder and a mysterious black-hatted man in a small Nebraska town. The story’s heroes follow the man’s mysterious path through many years and miles to Nuremberg, where they bring the mystery to a startling and satisfying end. 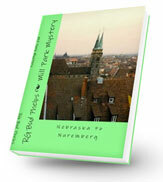 To purchase Mill Park Mystery or other titles by RG Bud Phelps visit our online store. From the point that “Mill Park Mystery” ends, follow the continuing adventures of Reg and George, who have been assigned by a special task force to search for private art collections taken from Jewish families during WW II. An exciting tale of intrigue and romance. 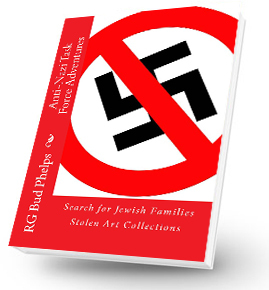 To purchase Anti-Nazi Task Force Adventures or other titles by RG Bud Phelps visit our online store. This book is a Historical Fiction story about a specific area in Conifer, Colorado; called Shiloh. The story is written about the historical significance of being Pioneers in both the 1870’s and the 1970’s. The first part of each chapter, dating back in the 1870’s, features a young ranch-hand/cowboy from Nebraska seeking gold in Colorado. The second part of each chapter, also dating back in the 1870’s features three Mormon families from Illinois wintering in Colorado on their way to Salt Lake City. This story is not about Christian or Mormon beliefs but instead their Pioneering spirit. The 1870’s were restless times because of the movement across this great country of men seeking gold, and many family groups seeking free land and/or a place to practice their own beliefs. The third part of each chapter dating back in the 1970’s features a young family moving from Denver’s suburbia to a newly developed area within Conifer called Shiloh. 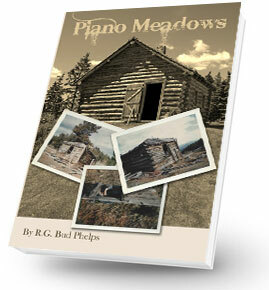 To purchase Piano Meadows or other titles by RG Bud Phelps visit our online store.